In today’s digital era, nobody will carry conventional collaterals or other marketing material. The mobile app certainly makes your sales reps more efficient and productive. 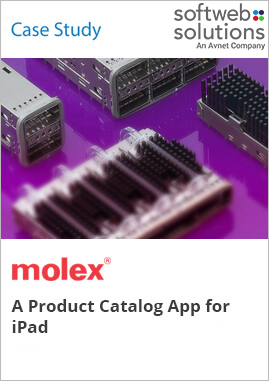 Molex is a leading provider of electronic components and solutions. Our client wanted an interactive product catalog app with animated images and videos of the products that one can easily download without internet connectivity. We delivered an innovative product catalog that displays the client’s entire range of products with an attractive presentation. With a smooth and crisp navigation, the app provides access to product information, product literature, and user can search for specific products with ease and accuracy.